Alicante to Benidorm airport transfer to all Hotels and Resorts – Over 200 kilometres (120 mi) of Mediterranean coastline in the Alicante province, on the southeastern coast of Spain. Popular destination for British tourists. The Top localities are Alicante (Alicante/Alacant), Altea, Benidorm, Xàbia (Jávea), Benissa, Calpe, Dénia, Elche (Elx), El Campello, Finestrat, Guardamar del Segura, Alfaz del Pi, Orihuela Costa, Pilar de la Horadada, Santa Pola, Torrevieja, and Villajoyosa. 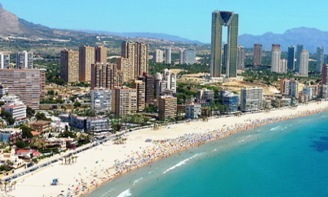 Benidorm and Alicante cities are the major tourist centres. If you want make Holidays here than you need to book a flight & Hotel first to Alicante and dont forgot to reserve your Alicante to Benidorm Airport Transfer before you arrive in Alicante. Alicante, the popular harbour town in the south of Spain, is known for its vine, the sweet oil, the mild, maritime climate and the impressive castle Castillo de Santa Bárbara. Alicante is also a very history charged region. You can visit the imposing castle, the monastery of Santa Fez, the Museo de Bellas Artes Gravina, or the castle of San Fernando. Or you can simply enjoy the cosy lifestyle in the picturesque harbour district and the salutary climate. Until you can indulge in the diversity of sights and possibilities to spend your holiday-time, you have to get from Alicante Airport to your final destination. In this matter our Alicante Airport to Benidorm Transfer comes into play. Benidorm is popular with tourists from the UK, Ireland, Germany, Belgium and the Netherlands. 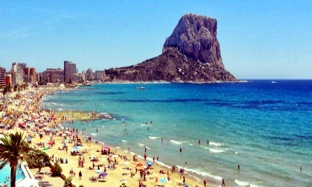 Benidorm has three major beaches: Playa de Levante (val. Platja de Llevant), Playa de Poniente (val. Platja de Ponent) and Playa de Mal Pas (val. Platja del Mal Pas) ; all of them have had a blue flag since 1987. Holidays in Benidorm nice Beach Hotels are very popular. If you want make your holidays in Benidorm than you need a Airport Transfer from Alicante Airport. Our Alicante to Benidorm airport transfer service will bring you to Benidorm Hotels and Resorts in that area. This transfer service is a door to door service, we will pick you up on time and will bring you without stopovers to your Hotel and back to the Airport. Alicante is a very nice place to be and over the last decades more and more people came to love the region for it’s incredible diversity. 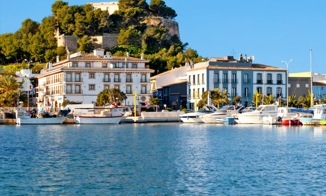 But before you can start your holidays in Alicante, you have to reach your hotel, resort, or cottage. The Aeropuerto de Alicante is more than 7 miles away from Alicante Downtown Area. So it wouldn’t be very convenient, to cover this distance (with all your baggage) by foot. And even the local cab companies are generally not very comfortable and first and foremost fairly expensive. So you can wait until the bus of your tour operator (if existing) is full up. But even in this case you loose a lot of time and nerves. Because of this well known problem, we offer a fair, fast and secure Alicante Airport Transfer Service to all travellers. Trough the years we took thousands of clients from all around the world to their vacation destinations. By using our Alicante Airport Taxi you can benefit from our longstanding experience in this business. Alicante to Benidorm airport transfer. to Albir, Alicante city (all areas), Benidorm, Calpe, Ciudad Quesada (Rojales), El Campello, Javea / Xàbia, La Marina, Moraira, Orihuela Cotsa, Playa Flamenca, San Miguel de Salinas, Campoamor, Benissa, Murica, Moraira, Guardamar, Torrevieja. If you have a question to our destinations are not listed here please contact us. To check all rates from Alicante Airport please visit our Rate page. If you decide to use our Alicante Airport Transfers, we pick you up at Alicante Airport punctual and take you to your hotel, resort, cottage, to Torrevieja, Calpe, Benidorm, Denia, Altea, Moraira, Murcia, Orihuela Costa, Guardamar, La Mata, or any other destination as soon as possible. Even if your flight is delayed, our driver will know and wait for you until you arrived. We only use valuable cars from reputable manufacturers like Mercedes Benz, Volkswagen or Ford. Of course each of our shuttles is air conditioned and we are open for your special requests. So we render services like costless kiddy seats if needed. For any questions, change requests, or suchlike an english speaking customer hotline is available for our clients. And best of all: Our Alicante Airport Transfers are 100% risk free for you. The booking is indeed made in advance, but the payment takes place later on site. Alicante Airport Transfers – How to book? You can book your Alicante Airport Transfers online, you can use our online booking form. Or you can book conveniently via our contact form. You will get your travel documents within the next 30 Minutes. If you want to get further informations or advise us of your special requests, please call our english speaking hotline under +44 1223 790179 or +34 965020820. We are available for you daily from 9:00 am to 7:00 pm. We hope to welcome you to our Alicante Airport Transfer Service. We hope, that we gave you an understanding of the benefits from our Alicante to Benidorm airport transfer service and would enjoy to welcome you at Aeropuerto de Alicante soon. Book the transfer simply from home through our online form, without risk, because you do not pay ahead. If you need more information please visit our Frequently Asked Questions site.